The Hobbit, The Lord of the Rings, and Tolkien - The One Ring • View topic - Serenity now on the TVM! Yes...the last 2 days before we start to celebrate the Star Trek Starship Captains. I don't think he'll be very happy about it. Last edited by Tookish_Traveler on Tue Sep 01, 2009 4:57 pm, edited 5 times in total. "Now, Sven, I'd like a large, hot chocolate with some *nudgenudgewinkwink* additions." She lowered her voice, "Preferably rum, if there's any left." Hey, I dropped in to the neighbours for an hour or so, and you've already moved on to a new thread! I only joined (rejoined after a long long absence, eh?) the fun in these final days, but what joy! I'll never forget it...never! NeVAH! Waiter, there's a fly in my soup! And denial ain't no river in Egypt neither! Is that what I really look like right now? wow! Oh and look! The Svens have a welcome for us! My, my, the weekends are soooo slow around here. Not much happening at my end of the world. Had a good dinner of sandwiches and salads and fruit and now I just want to sleep. Actually, I've been dozing all day. I missed two innings of the afternoon ballgame today due to falling asleep in my chair. All that adrenalin that dropped into my system yesterday made it hard to sleep last night. I should be able to get a good night's sleep tonight though. Yeppers ..it's slow on the weekends when the weather is nice in various parts of the world. Glad you are catching up on you ZZZ's Calma. Rowan, I almost used that pic as one of my sigs. Alas, the month was too short. heliona, I'm pretty sure there's something called 2nd shotgun. If not, there is now. Hey Lee~, that phots you posted is rather.... uncanny. 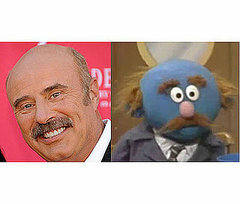 Dr. Phil is a muppet? Yes Tooks...that's exactly what I meant. The Svens brought us doggies. We see them shirtless all the time. I'm going to be reading slush. And I've been just sleeping for a good part of today. 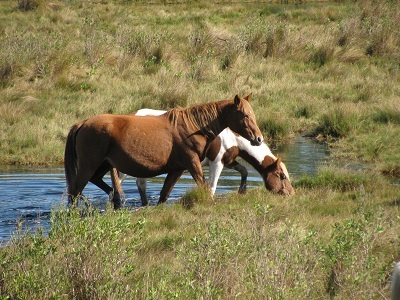 The hubby and the younger daughter made a long walk, and I would have loved to join them, but I was simply too TIRED. But, I had a nice and peaceful time while they were away and the high school graduate went to the beach with her friends, and got cleaned up after the party quite well. Plenty of leftovers from yesterday so I didn't even have to cook. Back to work tomorrow, help. So long as I can be the backseat driver, I'm good. Hope everybody is having a good weekend! Oooo, shiny new thread. I'll sit on top of the car! Wiiiiiiiiiiiiiiiiiiiiiiiiiiiinnnnnnnnnnnnnnnnnnnnnnd!!!!!!!!!!!!!!!!!!!!!!!!!! Yea...shotgun, 2nd shotgun, top of the car (I think this time the TVM will be a 1968 Mustang (okay...I just watched Bullitt). You all place nice (looks pointedly at Lee~). In other news, we had a nail-biter, but won the softball game 28-27. eek. We managed to hang on at the end. Go us!! Kudos on the Beaker pic, Rowan. 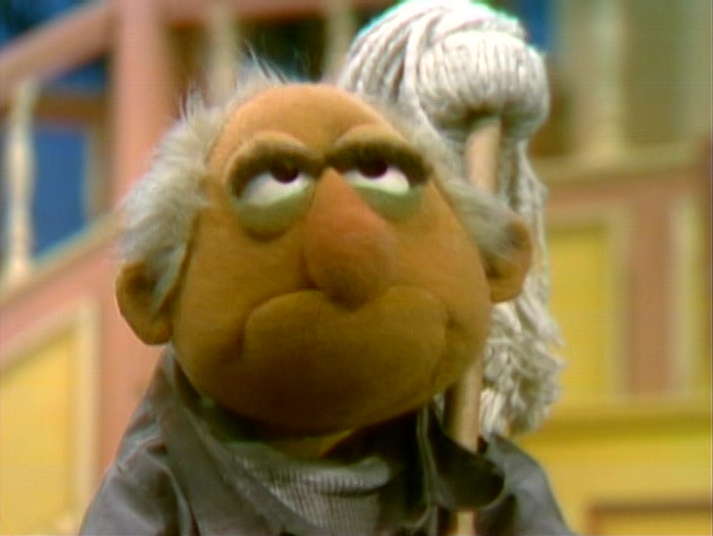 He requested that he be allowed to sing on today, the last day of Muppet month. I know that technically the Sesame Street characters are not 'THE' Muppets.. but is it true that 'Cookie Monster' is now 'Veggie Monster' and that there is no more 'Grouch' and that Bert & Ernie no longer live together? I had heard that the cookie monster wasn't allowed to have cookies anymore or create the impression that cookies were good... - so, I could imagine you are right there, Rose. Looks like it's not just your neighbourhood where the mind-control are busy at work. Last edited by truehobbit on Sun May 31, 2009 3:20 pm, edited 1 time in total. This story is false...Cookie Monster still loves and eats cookies and hasn't changed his name. Bert and Ernie still live together and Oscar the Grouch is still grouchy. Well.. that's good to hear.. I guess! I should've thought to check out Snopes.. I do that for e-mails all of the time! I'M FINISHED READING SLUSH!!!! WOO! PARTAY! And what's more, I've finished sending out rejection letters and acceptance letters with contracts. Get me a Perpendicular Hula on the double! Don't make me separate you young ladies!!! Seriously. You'd think you two were sisters. Hey! Think you can move house while I'm not looking???? "I will always find you, especially if the Svens are out on display like that! Whoa! Thanks, Dubs! Wenchie, so sorry about the chicken. Calma, those people you work with should get down on teir knees and thank you for being there almost eveyrday! ST, love the lizard. Very cute. Scribbles, you stopped working yet? Tooks, which Captain are we starting out with? 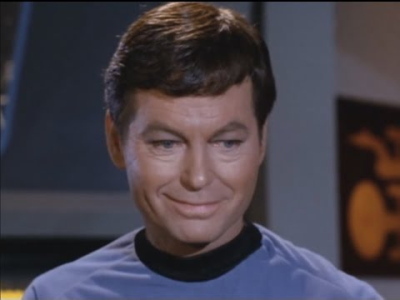 The Original Kirk? About 35 minutes until tomorrow here in YooperLand Michigan, folks. Wonder how many pokes I can get in before midnight. Well, I promised I was going to catch up but unfortunately, it's been a less than stellar day, which in turn made it into a less than stellar weekend . . . It's gone. One moment of bad roads and bad judgement and one bay of the garage is hauntingly empty tonight . . .
"I just wrecked the car."
. 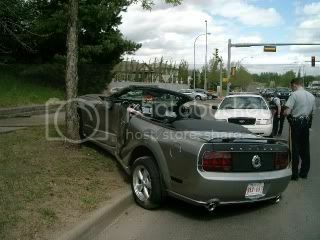 . . "the car" of course, was our beautiful 2008 Mustang Convertible . . .
Y'know, that's the phone call I never want to get . . . thank the Good Lord in Heaven that he's alright. THAT of course was my first question "I don't give a crap about the car, are you all right!!!!" And I had to ask twice!! Sheesh, men. But he got off lightly; a bruised thigh and he says, his lowest rib around back is hurting a little bit but no gashes, no blood, no breaks. I made him promise to go to a Medi Center tomorrow and get checked out anyway. He could have a bruised spleen or any number of minor internal injuries . . . But the car is a write off. Damn. Our beautiful baby is gone . . . just like that. The Lord giveth . . . and the Lord taketh away. And thank you Jesus that you took the car and not my hubby . . .
Sending healing energy to you and your hubby. I hope he is only as hurt as it would seem on the surface. And for your baby. She was a good car and served you both faithfully. OH NO!!!!! Scribbles! You okay? In shock I am guessing. Wish I could be there for real and hug you. I'm glad Mr Scribbles is okay. Looks like it could have been worse. Hope he doesn't have anything wrong internally. Poor car. Will insurance cover the cost of a replacement? I'm okay. I still can't believe she's gone, but alas, it's true. And yes, we took out a "replacement cost" clause on our insurance, so they will replace the car since it's totally written off. I think hubby feels far worse, he had done a lot of work on the car already to make it "personal". You can see in the picture, he blacked out the back panel and darkened the taillights, then mounted the old-style raised Mustang lettering across the trunk. The non-visible things were a cold-air intake, a performance tune and MagnaFlow exhaust with bigger chrome pipes. All things he can re-do when and if we get another, but you know how it is . . . he's devastated. But right now, our biggest concern is the two tickets he got. If they're high demerits, they could cause him serious trouble with his work . . . But as I mentioned before, I'm just so grateful to God that hubby is alive and the other good thing is that it was a single-vehicle crash. He didn't hit anyone, nor did anyone hit him. It was all bad road conditions and well, maybe a bit of a heavy foot . . . But thank heaven no one else was involved or seriously hurt. Well, except for that poor tree. But I'm pretty sure the tree has already forgotten about it . . .
oOOO. Too bad about the car, Scribbles. Glad the hubby is okay. Thank goodness for things like seatbelts and airbags. Testosterone and fast cars are not a good combination. As for Lee~...... we could ground her. But then she'd be here all the time. So we won't ground her. Aw, Scribbles! *sniffle* *sniffle* And she was such a beautiful baby too! I'm glad your hubby is okay, though. I mean...it could have really been bad. On another note...I saw Sesame Street DVDs at Sam's Club a couple weeks ago and was soooooo tempted to get a set. Edited because, for some reason, I got Dubs and Scribbles mixed up! Scribbles, I, too, am glad your hubby is well and I do hope he does go see a doc. Looking at that picture, he took quite a bumping. She was a good car. She gave you some of the greatest times of your lives. Maybe we should speak with Treebeard about wandering Ents in Canada.